In this Ferris Wheel episode, I speak with Kelly Goto, an evangelist for design ethnography and Principal of gotomedia about the Rapid UX Research mindset. As an evangelist for design ethnography, Kelly is dedicated to understanding how real people integrate products and services into their daily lives. Kelly is principal of gotomedia LLC and gotoresearch, a global leader in research-driven, people-friendly interface design and strategy for web, mobile, and product solutions. She has worked with clients including Samsung, Hyundai, Sony Ericsson, Nokia, Adobe, and Seiko Epson Japan. What you will learn – UX Research Mindset and more! As product makers, we are always looking at making better products and doing that faster. 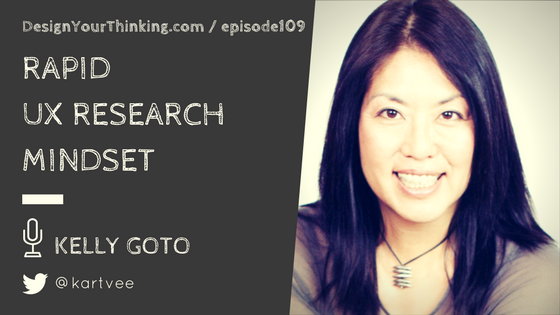 In today’s episode, Kelly Goto talks about why doing UX Research is important for companies and teams. While doing a ton of marketing research might seem like a lot of research, doing the right kind of research can make a big difference in understanding users and customers, before we end up spending time and money in building an unvalidated product. Have you trained or coached other product people to do what you are doing as a designer? How successful have they been in being able to replicate the results? Every startup that makes products is spending a lot of time and effort on designing products and experiences. What are the biggest mistakes you see these product makers and startups make in their pursuit of design finesse? What do you see as a waste of time in what they do today? If you had to coach me for 4 weeks to make and launch a successful product with the best design and experience, and you had a million dollars in the line, what would the coaching look like? How much is ethnographic research important for my product and company and how do I measure the outcome?”. Can you throw some light here?